Leeks: We planted these in early June and have been watching them slowly grow, with excited anticipation for this time! Leeks are in the Allium genus, like onions, shallots, garlic, and scallions. Like their relatives, leeks are one of the more difficult vegetables for us to plant, because they are spaced only ~three inches apart. So in a 180ft. bed we have more than 700 leeks! We jokingly bemoan onion and leek planting in the spring, knowing that having an amazing allium supply all winter is worth the work. Delayed gratification ftw! 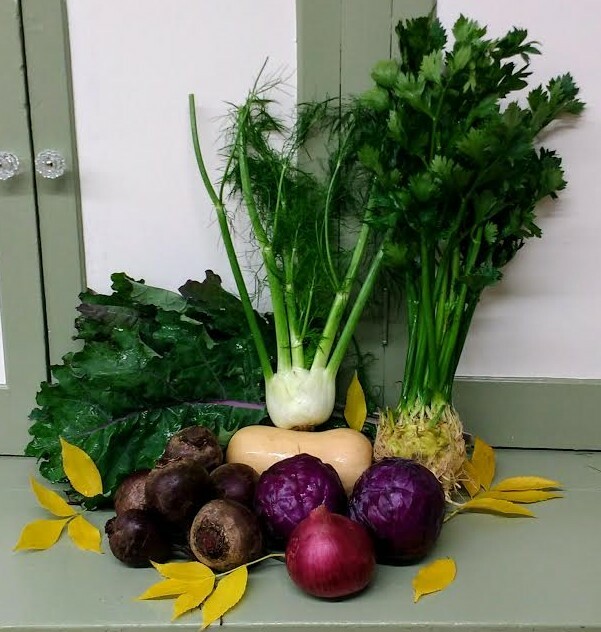 Mustards: These beautiful mustards are mild in taste and come from Wild Garden Seed (Karen and Frank Morton in Philomath, OR, the folks who bred Red Ursa kale). This seed came pre-mixed and we direct-seeded it into our fields, just as we do with our salad mix greens, which we cut when they are smaller. I like to throw mustards in at the end of stir-fries or soups, and Katherine has a great mustard-frittata recipe up, if you need ideas! Ostergruss Radishes: Ostergruss, this magenta, carrot-shaped radish, is a German variety and translates as “Easter Greeting.” They are crunchy and definitely have a kick, so if you want to tone down the spiciness, I suggest cooking them. Unfortunately a lot of them came out of the field with splits and rot, so we had to lower our originally intended distribution. We hope you enjoy the beauties you are getting, though, and our fingers are crossed that the later planting will be more successful! Yukon Potatoes: I don’t think I’ll ever get tired of potatoes, especially SIO potatoes. This week’s potato distribution is a large one…impress your friends with a diverse potato platter! These yukons came out of our “Howell” fields, the northern fields closer to Kruger and west of Howell Territorial Park (see satellite image below). The soil in these acres contains more clay and is more rocky than elsewhere on the farm, so the yukons suffered some skin damage when dug up with the tractor. Not to worry! While they may not look as pretty as past potatoes, they are certainly just as tasty. 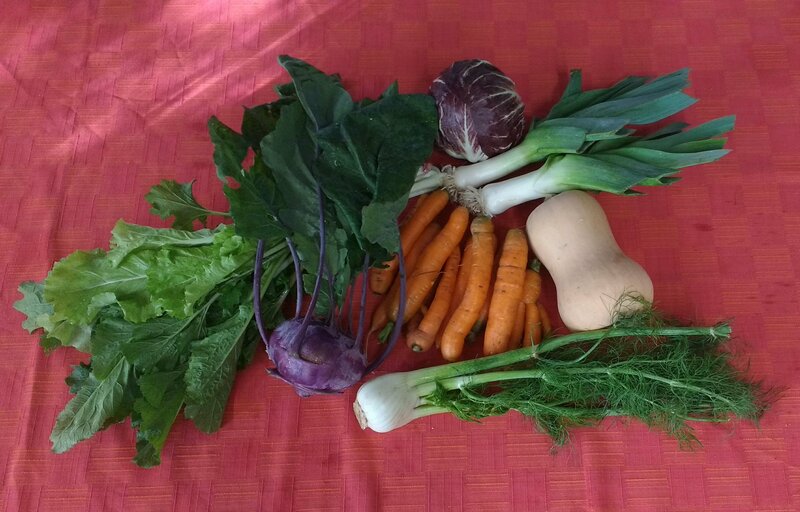 Want to make a choi-radish stir fry, a chard and potato pie, or roasted delicata squash with shallots for dinner? 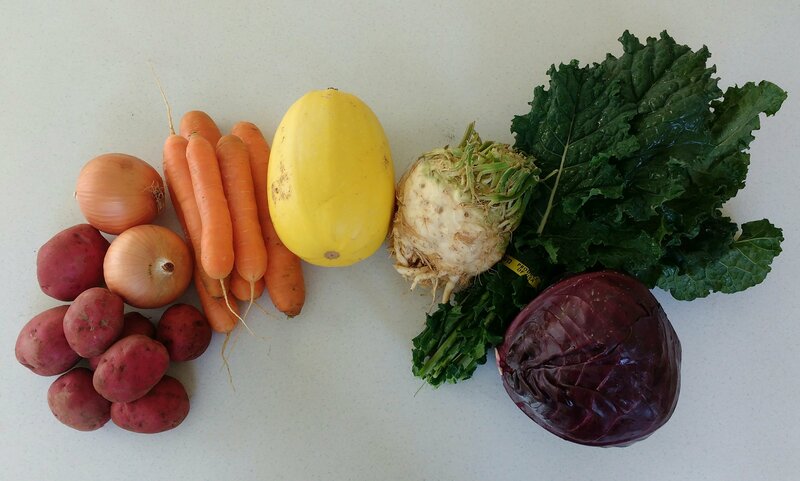 Check out Katherine’s recipes for this week! Yum. Week #19. There are still 5 weeks to go after this week! 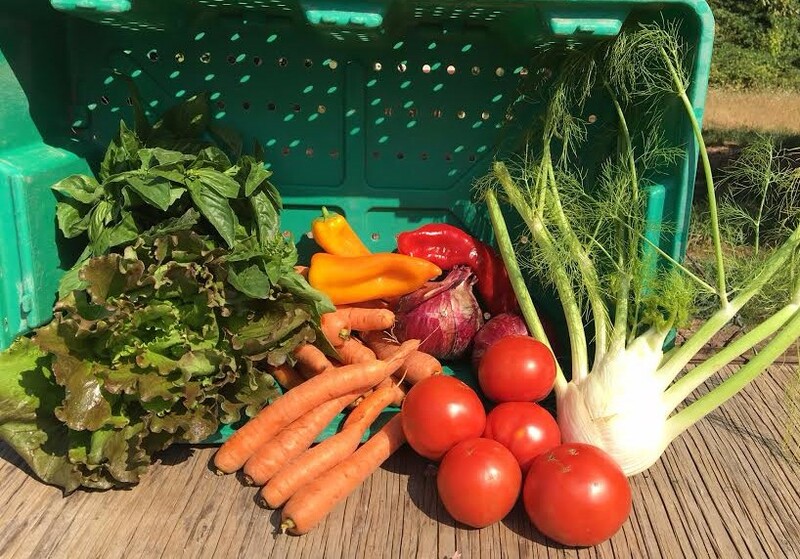 The last CSA pick ups are 11/14 and 11/16. Squash (Butternut): I like these a lot because nearly the whole squash is edible…less seed scooping! Butternut pairs great with pears (hah) and apples, which are also in season right now (I recommend Apple Fest at the Portland Nursery, this weekend and the following!) I recently ate a butternut-pear soup with ginger cream drizzled on top of it (omg…winter squash season is just the best). Like delicata and acorn, keep them on your countertop or in a cool, dry cupboard, but you butternut forget about ’em! Happy October! We are now on week #18. Carrots: They keep coming! For those of you who are feeling overwhelmed with all of the carrots you’ve been receiving , I suggest spending a couple of hours making a big pot of carrot soup. Fall is a great season for soup, and if you make enough of it you can freeze it for winter use. Want something sweet instead? Try making carrot cake! Kohlrabi (Azur-Star): Purple kohlrabi is back! It’s crisp and sweet and often compared to broccoli stems or radishes. Like in June, we left the tops on, so you can cook those up with your kale. Lettuce (Romaine): I think the romaine this week is extra sweet and delicious; the cool nights and mornings are keeping it nice and crisp. 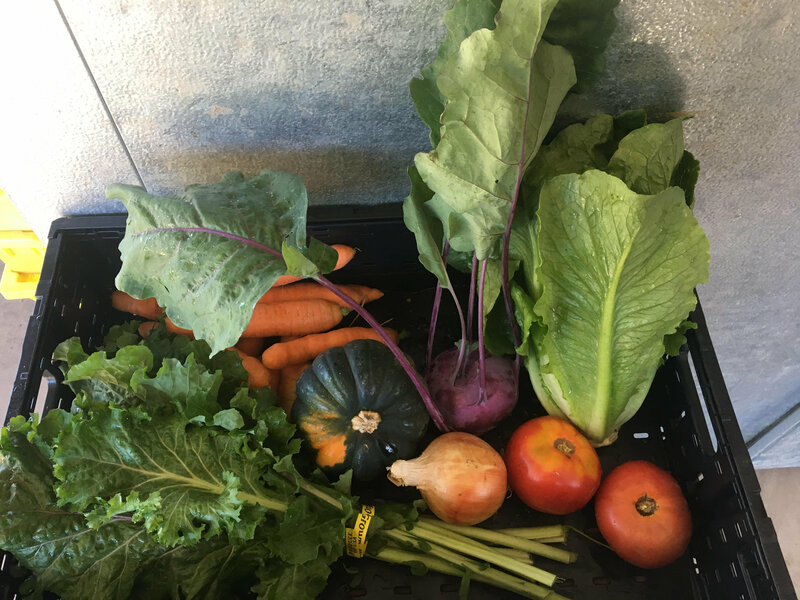 This may be the last head lettuce distribution…we have a few more beds planted but the lettuces are very small and not likely to get much bigger. Instead of distributing them as head lettuce, then, we’ll just use the little leaves for our salad mix. Squash (Acorn): This tough-skinned squash is a good one to halve and stuff, and you can eat it right out of its own bowl. Here’s a picture from last year of Katherine’s red chile and black bean stuffed acorn squash. Yum! Tomatoes: Ripening slowed when the temperature dropped and rain hit two weeks ago, but we are happy we can bring you one last week of tomatoes this year. Remember to check out Katherine’s recipes (and videos!) Thanks, Katherine! Baby Beets: Some beets are bulky and some beets are bitty, and this week we’re handing out the little ones. They take longer to weigh, but less time to cook! Best to boil these blessed baby beets and then blend some batter for beet brownies! Cabbage (Ruby Perfection): These deep purple cabbages are small but very dense. When eaten raw, they are slightly spicy, and the thick leaves add a nice crunch to salads. You can also cook them into stir fries (I like adding red cabbage to curries) or pickle them. A very beautiful and diverse cabbage, I like to think that Ruby Perfection is greatly admired by all of the other cabbages in the cabbage kingdom. Some of the ones we’re distributing this week have little speckles on their leaves, but this is only cosmetic, so use away! Squash (Delicata): Like watermelons and cucumbers, squash are cucurbits, and there are so many different and delicious varieties of winter squash. Delicata is one of the more well known, and for good reason: it’s sweet, easy to cook, and has a thinner skin than other types of squash, so you can leave it on and gobble it right up. Quarter it, scoop out the seeds, stuff it or don’t stuff it, bake it, and enjoy! Tuesdays are a big restaurant pack-out day at the farm, and Jen (above) and Jesse are always bustling about the packhouse, playing cooler tetris and packing up assortments of our tasty veggies. Our Wednesday deliveries are usually the heftiest ones, with our two drivers (who include Nate, Zack, myself, and Jerry, Jen and Jesse when needed) each making about 14 stops during the high season. Since he took on the position of restaurant account manager three seasons ago, Jesse (below) has done a wonderful job maintaining and developing our relationship with restaurants and stores with whom we have shared values and mutual appreciation. It would be impossible for me to name all of our customers (and you can find a more comprehensive list on our website), but here are just some of the places we are happy to be consistently working with: Screen Door, Daily Cafe, Red Star Tavern, Aquariva, Three Degrees, Grand Central Bakery, Airbnb, Reed College, Food Front Co-op, World Foods, Coquine, Toast, Ground Breaker Brewing, People’s Food Co-op, Alberta Co-op, Rubinette, Quaintrelle, Grain & Gristle, and University of Portland. Red Ursa Kale: This variety of kale was bred by Frank Morton, who, together with Karen Morton, founded Oregon’s own Wild Garden Seed company in 1994. 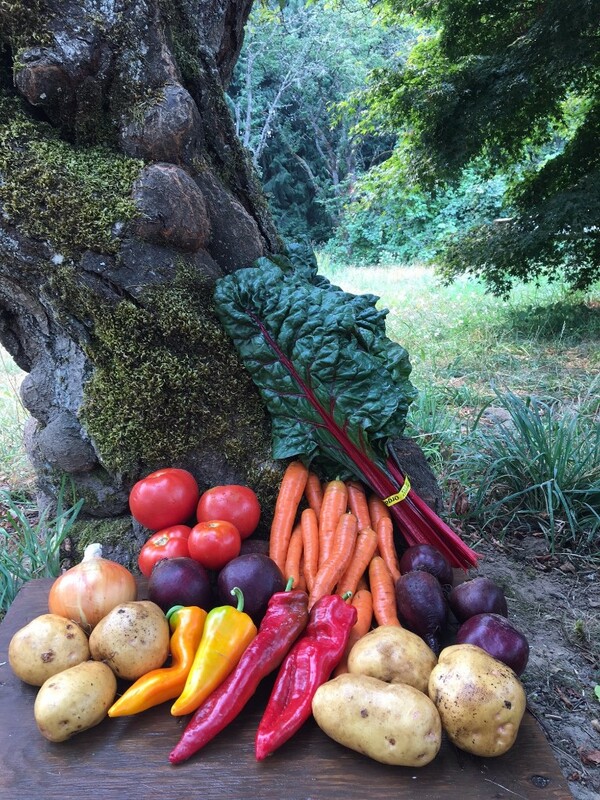 Wild Garden Seed is an organic seed and vegetable farm located in Philomath, Oregon, and we order many of our seeds from them. Breeding Siberian Kale with Red Russian Kale, Frank Morton created Red Ursa, and won an award for it when it was selected as one of the ‘5 Best New Introductions of 1997’ in the National Gardening Trials. It adds a nice color and texture to meals, and is tasty both cooked and raw. Radicchio: This Italian chicory is tried-and-true, our favorite to grow at SIO. It is big and beautiful and bitter in the best way. If you want to mellow the bitterness, you can grill or roast it. My favorite way to eat it is raw, mixed with shaved carrots and an orange-honey vinaigrette. Yukon Potatoes: They have some blemishes, but are still super tasty! What’s left in our greenhouse: herbs, kale, chard and lettuce for the winter! Our baby brassica field for salad mix (arugula, mizuna, and various other mustards). The white cloth on the fields is Reemay, the row cover I mentioned in last week’s blog. It does a great job protecting these tasty little plants from insects. Look at all of the celeriac! This is the field we harvested last week’s celeriac from, and there will be plenty more to come! Beyond the trees in the background exists a wetland; we are excitedly awaiting the return of migratory birds to the area. 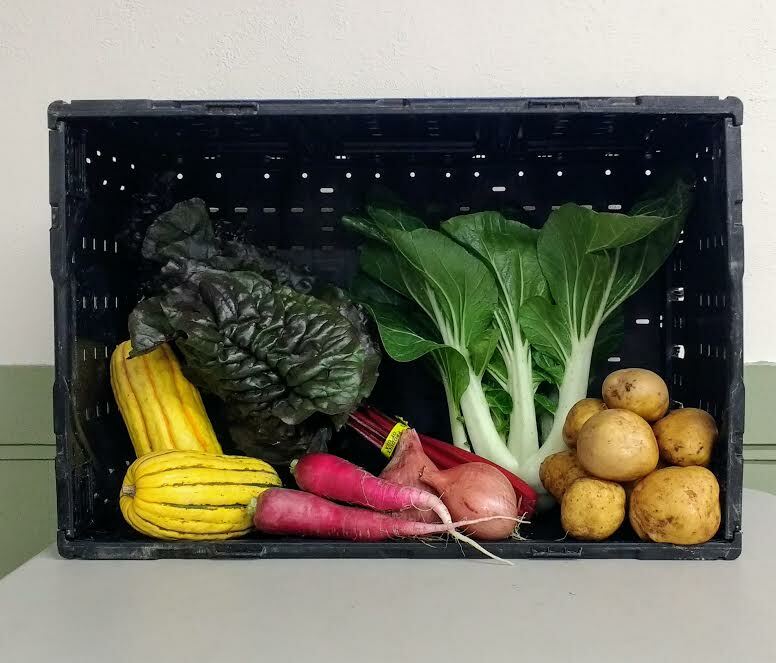 We call these ‘squash boxes’, but we harvest most of our root veggies into these boxes too. Our managers tractor these boxes out to the fields we’re working in, and we put a plastic liner in them and fill them to 600 lbs. 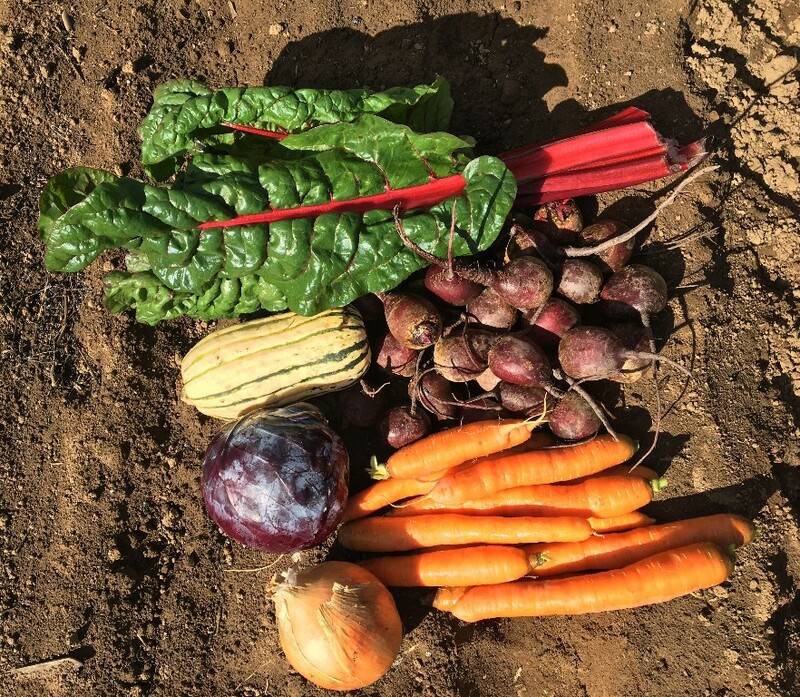 of beets, carrots, corn, celeriac, cabbage, or winter squash. They can be stacked on top of each other (as you can see from the picture), saving space in the cooler, and saving us from time spent washing loads and loads of smaller bins. These are also the boxes we use when we send our veggies to long-term storage over the winter. Thanks Jerry and Brian, for building some of these last year! Jalapeños: This share is heavy on the peppers, some of my favorite SIO crops. Our jalapeño plants are amazing- I harvested these on Monday and some plants had up to 20 mature fruits on them! The ones that have white stretch marks on them or that are starting to turn red are older than the smooth green ones, and generally spicier. Poblanos: Tiburon, the variety of poblano we’ve been growing for as long as I’ve been at SIO, has large yields and larger fruit than other poblanos. Poblanos are typically used to make chiles rellenos, and are called Ancho when dried (Ancho chili spice). They are super tasty roasted or stuffed, and also provide a nice kick if you’re making salsa. Enjoy! Meet Steve! Originally from Charlotte, Michigan, Steve moved to Portland about five years ago, and this is his third year at SIO. Steve works hard and can do many things around the farm; we rely on him as a harvester, irrigator (his favorite) and Reemay expert (Reemay is the white clothlike row cover we use to protect our crops from insects and frost). 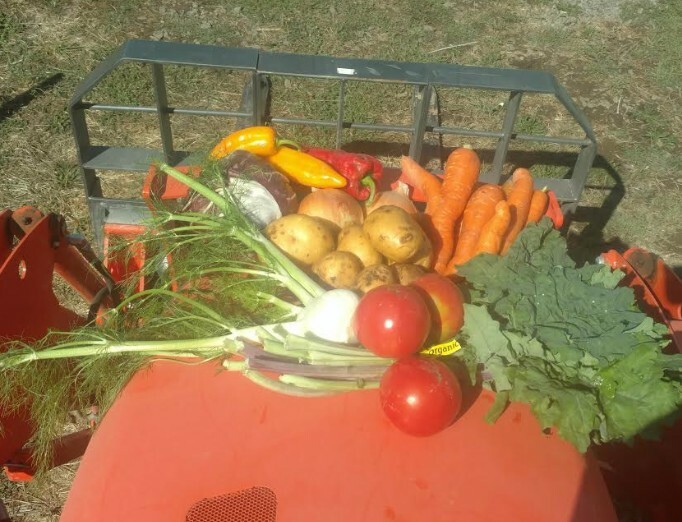 Steve is also doing some tractor work for the first time this season, and thus far has learned how to mow and use the forks to transport our big wooden harvest boxes from field to packhouse. He is pictured above and below with tomatoes, apt photos since they are one of his favorite SIO crops. Steve is also DJ “Space Dogg.” He makes his own electronic music, and last year recorded sounds from the farm to mix into his tracks. He has played at Plews in St. Johns a couple of times, and we look forward to supporting his future endeavors! Steve is also one of the best cooks I know; he mushroom forages every year, can create wondrous meals with every type of vegetable, and makes delicious canolis from scratch. His dream is to one day be like chef Magnus Nilsson (Chef’s Table, anyone?) and open a farm-to-table restaurant. Welcome to week #13, and happy almost Labor Day! Basil: We have more basil! The ideal storage temperature for basil is 50 degrees (have any dark, cool cabinets?) If you don’t want to turn it all into pesto or have a big caprese salad party, try putting it in smoothies or chopping it up for garnish on top of pasta or curry. Onions: We have been harvesting our onions in bulk since the beginning of August. This is normally an afternoon activity, and at the end of the day we spread them out in the greenhouse to cure. These ‘storage’ onions will do just fine sitting on your countertop for weeks, but why wait? Sweet Peppers: Peppers are here! We are distributing Jolene’s and Gatherer’s Gold, both Italian sweet peppers. These peppers are great for roasting; I peel the skin off of mine after baking them (ah, that smell!) to ensure an extra smooth texture. If it’s too hot for you to cook this week, you can store them dry in a plastic bag in your refrigerator for 4-5 days. They are ripening pretty slowly on the plants, but we hope to get you a larger distribution in the weeks to come. If you pick up at Lincoln Street Church on Tuesdays, you already know Miranda Trostle, but for those of you who don’t, here she is! Miranda joined us in the spring of 2016 and has been a huge asset. She is a great team member on whatever job she is on, but we utilize her excellent salad-land skills the most. In this picture she is sitting in our beautiful lettuce mix field, with spinach, chard, mini-heads and salanova in the beds to her left, and chicories to her right. When Miranda is at SIO, you can typically find her harvesting greens for our salad mix in the morning, and washing and packing those greens in our packhouse in the late morning/afternoon. When she is not at SIO, Miranda stays busy working in her pottery studio in SE Portland, Sego Lily Pottery. As you can see from the pictures below, she creates beautiful, functional pieces, with the goal of enhancing the rituals of daily life for her customers. Her productions (tableware in particular) fit nicely with her passion for growing, cooking, and eating local food. 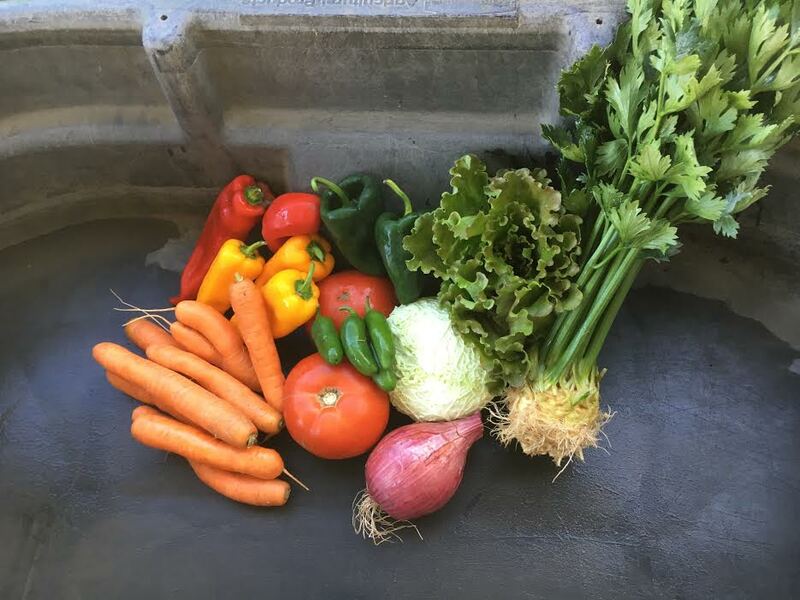 As she says, “There is nothing quite as satisfying as eating a meal of organic veggies from the farm off of a hand-made plate!” Miranda looks forward to participating in various craft fairs this fall…keep an eye out for her! You can visit her at www.segolilypottery.com, or for you Instagramers out there, @segolilypottery.